For all we know, time is consistently moving forward, never backward, never jump in to certain time and go back to square one. That means, living creatures always grow older, never grow younger. That’s the law of time that applies to our space, our dimension. Perhaps the time-jump happens in other dimension. Perhaps the time inconsistency happens in the future, like in Looper movie, not in our present. It definitely doesn’t happen naturally in mother nature. It caused by disease like in The Curious Case of Benjamin Button movie, or by genetic-anomaly like in The Time Traveler’s Wife movie. If time-jump does exist, one kind of job that will probably exist is Looper, the one that kills people from the future who’s being sent back to the present time (read: 2034) to be killed. Payment to do this kind of job? 3 bars of gold. Payment to do this kind of job if the present-Looper should kill the future-Looper? A suitcase full of gold bar. Payment if failed doing the job? Own self. A young-Looper, named Joe (casted by Joseph Gordon-Levitt), finds out the hard-truth after attending his friend’s “big pay off” party. He doesn’t believe it at the first time, until he has a mission to “closed the loop” of himself, to kill future-Looper (casted by Bruce Wills). Of course at first, he doesn’t know the man in the blindfold that he has to kill is his future-self. Once he know, he has 2 options: to kill his future-self, live life wealthly by spending the gold bars that he has collected, and prepares to die at the time, the place, and the way that he precisely know. Or to not kill his future-self, run away as fugitive because the payment to not do the given job is be killed by the company who gave him the job. The movie tells us what happens to young-Joe when he choose option 1, or option 2. Later did he know, he has option 3. By finding out the real reason the company send their own future-Looper back to present time. Turns out, both of option 3 and the real reason have something in common, the future-boss of the company; his own kid. As a young man who doesn’t understand the meaning of settling down but longing for a warm family, his decision might affect the future of a kid who could still live in a loving family, thus wouldn’t turned the kid to be like himself, a person who killed another man for his own benefit. By the end of the movie, young-Joe chooses to finish the job he got, by giving a new meaning of it, cloosing his own loop. If people in Looper movie could go back and forth of time by using machine, there’s only one person who could do so in this movie due to anomality in his genetic, Henry de Tamble (casted by Eric Bana). If the adapted-movie exposes Henry’s journey as the time traveler himself through time, the original-novel truly exposes the point of view of the time traveler’s wife, Claire (casted by Rachel McAdams) (read here for more). How young-Henry survived from tragic car accident. How young-Henry met old-Henry for the first time, How young-Henry traveled through time for the first time. How adult-Henry talked to his mother after she passed away, How adult-Henry struggled with no clothes and money in the present time after jumping-time. How adult-Henry met Claire for the first time. How young Claire met old-Henry for the first time. How old-Henry married to Claire. How old-Henry had to share Claire with another man, the young version of him. How Henry and Claire’s marriage, and their struggle to have a kid. How time traveler Henry could not control when, where, and why to travel. These all captured imaginatively and perfectly in the movie. But it’s kind of confusing to watch by the time-jump, if we haven’t read the novel. Not to mention, the movie could make us, the believers, believe further that human does evolve, thus time-jump is possible to happen through evolution. If the time sequence in Looper and The Time Traveler’s Wife movies go back and forth through time, in this movie the plot is moving forward, started from the day Benjamin Button (casted by Brad Pitt) born in World War I to the day Button died. From the bald-wrinkled-strong-mind Button to the young-handsome-yet-dementia Button. Interesting? To watch, yes. To live with, not. When a baby’s first walk is celebrated by adult, osteoporosis-Button’s first walk is seen as miracle by other people. In fact, a preacher died instantly after seeing Button’s first walk from his wheelchair. When Button has his puberty and needs to satisfy his urge, there’s only one pros*titute who wants to sleep with him, because the others are afraid of Button’s appearance. When Button finds love in someone, the one that he loves is an underage, and expressing his love might seem as attacking minor. Button has fallen in love with Daisy (casted by Cate Blanchett) since he was 5 years old. But Button has to wait 42 years to finally able to spend live with Daisy. Because when they were young, they were from different world. Young-beautiful-balerina Daisy is so uptown compared to unattractive-wrinkled-blue-collar Button. Watching this movie makes us won’t think twice whether to grow old together with the person we love or to grow younger and watch the person we love die before us. This post has been published in DVRG Magazine. What will we do if one day we find out our things are being packed and sent away to a place miles away from home? What will we do if one day we’re being forced to move from home where we’ve lived since birth? Imagine it happened if we’re a 9years old boy who live happily in the beautiful side of Berlin and currently have 3 best friends for life. Mad and confused, for sure. And a lot of questioning for what have we done that made us being punished to live in the middle of nowhere. With no kids around to play with. With no playground in sight to play in. With no crowded street to stroll to on a saturday morning. With a terriying neighborhood 50 feet away from home. So what will you do at home to kill the boredom in such situation? Young kind-hearted kid like Bruno will build a swing from tyre on a tree at his house to play with. Or have a nice chat with the maids at home whom he seldomly talked with back in Berlin. Or maybe have a little adventure to find out why there is fence outside the gate of his house. The book tells us the humanity side of holocaust happened in Poland during World War II. About a strange friendship between Bruno, the son of German Commandant who lives in one side of the fence, and Schmuel, a Poland kid who lives in the opposite side of the fence who never failed to wear a grey stripped pyjama all day long every day. John Boyne successfully narate the situation Bruno caught in, both inside and outside his head. How Bruno always wondering how could there be many kids on the opposite side of the fence and none of them in his side of the fence. What Bruno and Schmuel know about their condition and how they become friends although not only a fence but also social background that separate them. How Bruno spontaneously think Schmuel’s house in Poland is not as good as his in Berlin because from what he knows Germany is a better country than Poland. How Schmuel hates soldier because he thinks of all them are bad while Bruno agress to disagree because he’s father must be a good soldier. A much talkative novel compared to the movie version. Too bad I watched the movie first instead of the novel. If gave me perfect image to fascinate when I read the novel. Although Bruno and Schmuel friendship goes in to the same direction both in the movie and in the novel, the movie captured the ending better than the novel. But rather than watch a slow pace movie, I’d prefer to read the novel that gives more information. Including for what happened with Bruno’s family after Bruno pronounced that Schmuel is his friend for life. What about you? An eye for an eye. The famous reason that lies behind most revenge to be conducted. It may seems dark, but it’s actually the antecendent of ‘Treat people the way you want to be treated’. Only the latter sounds a lot nicer. People do revenge means something bad happened to them first. It’s our reaction to treat other person the same way we were treated. But of course, revenge isn’t a must. And only wise people choose not to do so. While treating other people the way we want to be treated takes initiative and courage. Initiative to do the good deeds first. Courage to forget the past and move on to the present life we have. If we treat people good, then the eye we will get after is another good thing. If we treat people bad, then the eye we will get after is possibly another bad things. Why possibly? Because there is still a chance that the other hand uses his/her courage to forget the way we treated him/her and takes an initiative to do the good thing back to us instead. Or, he/she do the bad thing to us as been told by ‘An eye for an eye’. If the other people do not the eye-thingy back to us, believe me, there will always be party that will generously do it back to us. The universe for example. Or in tangible way, the court house. Have you ever think why people suffer death penalty? Mostly because they vanish other people’s life, I don’t know the case that doesn’t. But do you really think they deserve to die? ‘An eye for an eye’ is really a bad term. Only optimistic people can change it into a good one. Thus, the court sentences someone to die means the court kills the man itself. In other word, the court applies the ‘an eye for an eye’ terms, means the court is also the bad one here. Because I think, no human can sentence other human to die, not even human’s law. It’s God, the one who has the only right to tell when is human’s time is up this life. What can human do to the bad person is to give a lifetime punishment. Or, to lend a hand for the eye that person had thrown in his/her life. With this post, I hereby sign my support to demolish any death penalty in all court houses in the world. Because no person deserves to die, unless God tells to. I gratefully thank John Grisham for the meaningful writing in The Chamber that inspired me to write this entry. Buku ini berjudul lengkap “Gratis! 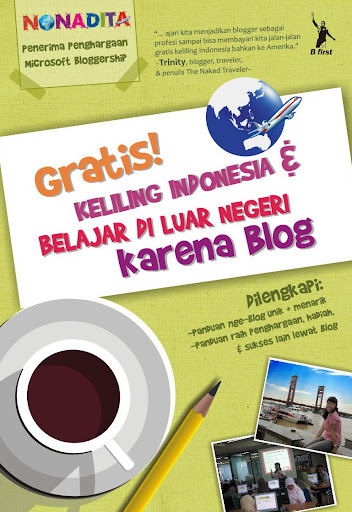 Keliling Indonesia & Belajar di Luar Negeri Karena Blog”, karangan NonaDita. Pertama kali terbit Agustus 2010 dan kebetulan saya sudah membaca bukunya karena kejadian ini. Sebenarnya saya sudah mengomentari buku ini disini secara singkat. Tapi berhubung ada permintaan, baiklah saya akan mencoba mereview lebih jauh buku mengenai pengalaman Nona Dita di dunia per-blogging-an *minta ditimpuk massa :p*. Tapi ternyata, tidak ada sama sekali langkah-langkah perintah tersebut. Pada buku ini, Nona Dita benar-benar menceritakan bagaimana perserpsi beliau mengenai blog, keuntungan nge-blog, dan pengalaman serta kisah sukses Nona Dita di dunia per-blogging-an. Sharing ilmu tanpa maksud menggurui. Diceritakan dalam bahasa ringan yang enak dibaca dan enak juga dihati hehe. Pesan yang dapat diambil dari buku ini adalah bagaimana kita harus mencoba untuk menjadi netizen yang bukan dan tidak menghasilkan sampah dunia maya, melainkan menulis hal yang berguna bagi orang lain, sekaligus berprestasi. A truly inspiring one! Berhubung banyaknya permintaan pada postingan ini, maka saya pun memberanikan diri mereview buku The Naked Traveler (TNT) 1 & 2 karya Trinity yang sudah saya baca. Bagi yang menunggu review buku 1 lagi, saya ucapkan terimakasih atas kesabarannya *minta ditimpuk :p*. Harap diingat bahwa saya membaca buku TNT1&2 out of the blue. Tiba-tiba iseng jalan ke toko buku, tiba-tiba iseng membeli buku, tiba-tiba iseng meraih bukunya mbak Trinity, dan tiba-tiba iseng langsung membeli kedua bukunya sekaligus. Saya yang pecinta komik ini memang suka geregetan kalau komik itu terbitnya satu-satu, jadi wajar saja kalau saya langsung membeli buku mbak Trinity 2 buah. Sudah percaya bakal bagus, sudah percaya bakal suka. Padahal saya sama sekali tidak mengikuti blog ataupun twitter beliau. Hihi. The Naked Traveler 1 menceritakan pengalaman bertahun-tahun traveling mbak Trinity ke tempat-tempat wisata yang pernah dijelajahinya. Pengalaman tersebut diceritakan dalam setiap bab, yang termasuk dalam beberapa subjudul. Seperti pengalaman traveling yang berhubungan dengan passport, airport, dan alat transportasi. Jadi tidak melulu menceritakan mengenai objek-objek wisata itu sendiri. Membahas traveling dari sudut pandang lain, mungkin lebih tepat disebut sharing pengalaman. Pastinya bakal berbeda kalau yang biasa kita baca Lonely Planet atau National Geographic. The Naked Traveler 2 masih tetap menceritakan pengalaman traveling mbak Trinity dengan objek wisata yang berbeda dari TNT1. Penceritaan yang lebih mendetail menurut saya, karena termasuk pengalaman keseharian mbak Trinity S2 di negeri orang, Filipina. Kalau di TNT1 hanya menceritakan pengalaman keseluruhan. Bedanya lagi, kalau TNT1 banyak menceritakan pengalaman backpacking mostly sendirian mbak Trinity, TNT2 menceritakan pengalaman traveling yang beberapa belas tahun kedepan, dimana mbak Trinity sering bepergian dengan teman-temannya. Berkat membaca TNT1&2 juga saya benar-benar ingin bisa mewujudkan mimpi saya untuk jalan-jalan, terutama backpacking, baik di Indonesia maupun di luar negeri. Berkat kedua buku ini juga, saya jadi sering jalan-jalan di Bandung, tanpa arah, tanpa tujuan, tanpa teman, benar-benar impulsif, sambil membawa kamera digital untuk menghilangkan stress (baca disini) . Sebagai latihan awal kalau nanti saya benar-benar menjadi independent traveler. Harus berani jalan sendirian di tempat asing. Dan harus muka badak juga tiba-tiba jepret sana jepret sini di tengah kerumunan orang *sebenarnya intinya sih kalimat terakhir ini haha*. Gaya penulisan mbak Trinity pada TNT1&2 overall tidak jauh dengan gaya penulisan beliau pada tulisan-tulisan di blognya, sharing pengalaman dari sudut pandang mbak Trinity. Oleh karena itu saya sangat penasaran untuk membaca novel mbak Trinity Tersesat di Byzantium, karena tokoh utamanya sudah bukan mbak Trinity lagi melainkan Duo Hippo Dinamis. Siapakah mereka? Mari kita mulai membacanya!